Here in the United States, the Fourth of July is a big day. 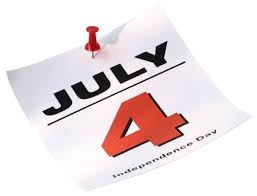 Back in 1776, there were a couple of days in the first week of July that were important. John Adams thought the Second of July would be celebrated for years to come, but we have settled on doing it two days later. Of course, other things have happened on that date. These are just a few. 965 – Pope Benedict V passed away. 1054 – People in China and Arabia looked in the sky and see a supernova. 1634 – Quebec, Canada was founded. Back then, it was called Trois-Rivieres and was in the colony of New France. 1636 – Providence, Rhode Island came into existence. 1754 – George Washington surrendered Fort Necessity to the French. That was an important event during the French and Indian War. 1802 – The United States Military Academy opened in West Point, New York. 1803 – The American people learned of the Louisiana Purchase. 1804 – Nathaniel Hawthorne was born. 1816 – Hiram Walker, founder of Canadian club whiskey, was born. 1826 – John Adams, the second president of the United States, and Thomas Jefferson, the third president of the United States, passed away. 1831 – James Monroe, the fifth president of the United States passed away. 1837 – Grand Junction Railway opened between Birmingham and Liverpool. 1865 – Alice’s Adventures in Wonderland was published. 1879 – British forces captured and destroyed Ulundi, the Zululand capital. 1882 – Louis B. Mayer was born. 1902 – Gangster Meyer Lansky was born. 1903 – Dorothy Levitt competed in a motor race. That made her the first woman to do that. 1914 – A funeral was held for Archbishop Franz Ferdinand and his wife. 1922 – Lothar von Richtofen, younger brother of the Red Baron, passed away. 1929 – Al Davis, owner of the Oakland Raiders, was born. 1934 – Marie Curie, who received the Nobel Prize in Chemistry and the Nobel Prize in Physics, passed away. 1943 – Geraldo Rivera, who looked in Al Capone’s vault, was born. 1946 – The Philippines gained independence from the United States. 1966 – Lyndon Johnson signed the Freedom of Information Act. 2009 – Steve McNair, former quarterback of the Tennessee Titans, was killed. It’s been longer than I realize.